You can open the MediaBay in the right zone of the Project window. This is useful, if you want to access the MediaBay functions from within a fixed zone of the Project window. Click Show/Hide Right Zone on the Project window toolbar, and at the top of the right zone, click the MediaBay tab. Allows you to search media files by name or by attribute. Allows you to go back to the initial tiles view. Allows you to show the results list for the selected tile. If no tile is selected, all media files that are contained in the selected Browse Location are shown. Click this tile to show the presets for the included VST instruments. 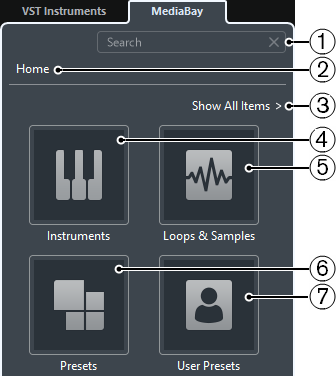 Click this tile to show audio loops, MIDI loops or instrument sounds ordered by content set. Click this tile to show the track presets, strip presets, pattern banks, FX chain presets, and VST FX presets. Click this tile to show the track presets, strip presets, pattern banks, FX chain presets, VST FX presets, and instrument presets that are listed in the folder VST Sound > User Content.